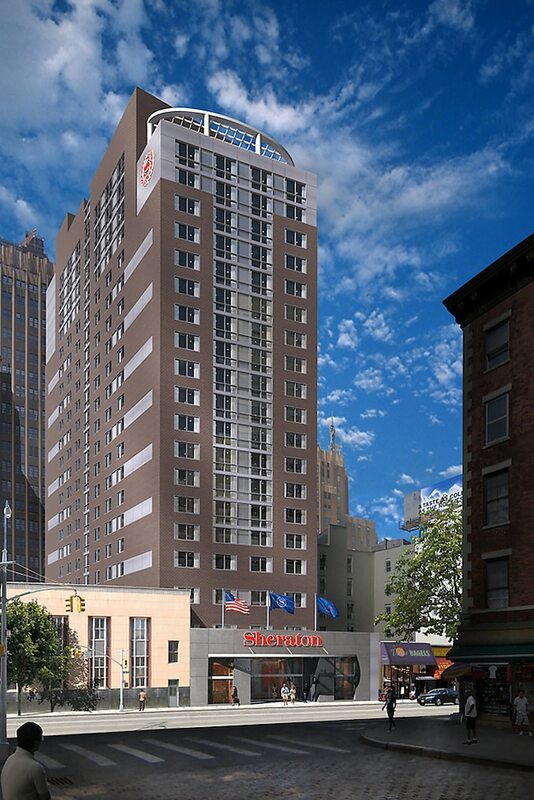 With a stay at Sheraton Tribeca New York Hotel, you'll be centrally located in New York, within a 10-minute drive of Washington Square Park and One World Trade Center. This 4-star hotel is 1 mi (1.7 km) from National September 11 Memorial and 1.2 mi (1.9 km) from New York University. Make yourself at home in one of the 369 guestrooms featuring refrigerators and flat-screen televisions. Your pillowtop bed comes with down comforters. Wireless Internet access (surcharge) keeps you connected, and cable programming is available for your entertainment. Bathrooms feature bathtubs or showers, designer toiletries, and hair dryers. For lunch or dinner, stop by Antica Ristorante, a restaurant that specializes in Italian cuisine. Dining is also available at the coffee shop/café, and 24-hour room service is provided. Buffet breakfasts are available daily from 7:00 AM to 11:00 AM for a fee. Featured amenities include a 24-hour business center, complimentary newspapers in the lobby, and dry cleaning/laundry services. Planning an event in New York? This hotel has facilities measuring 880 square feet (82 square meters), including conference space. Antica Ristorante - This restaurant serves Italian cuisine for breakfast, lunch, and dinner. A kids' menu is available. The Dutch Lounge - Dinner is served at this restaurant, which also offers a full bar. Room Service - Available 24 hours a day. This property's policy is to refuse certain bookings for the purpose of group events or parties, including pre-wedding stag/bachelor and hen/bachelorette parties. The property has connecting/adjoining rooms, which are subject to availability and can be requested by contacting the property using the number on the booking confirmation. Some facilities may have restricted access. Guests can contact the property for details using the contact information on the booking confirmation.